in the hills of North Carolina: water color and stencil are a match! Not only do I love this technique ( 2 prints are always better than one, right? ) but I love this stencil. 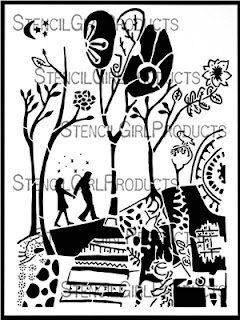 Love Story, designed by Cathy Nichols for StencilGirl, was inspired by her painting “If You Want to Get Lost, Follow Me,” and it depicts a couple holding hands walking through a magical forest. Sometimes you have to get lost in order to find your way. This stencil contains rich patterns, trees, and flowers, along with spaces in the tree roots where you can carve or paint in the words of your own love story.